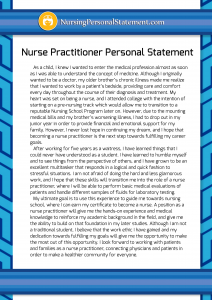 One of the many requirements for qualifying for a nurse practitioner program is a personal statement. A personal statement for a nurse practitioner seems to sound something like a self-introduction topped with your competitive GPA’s and shiny credentials. Sure it has your name, your title, and your academic achievements. But it actually is more than that. A nurse practitioner personal statement is not easy to start, let alone finish. Some experienced writers and practitioners alike have spent a whole day and possibly a whole night trying to proofread and perfect their writing. A nurse practitioner has a broad range of jobs and responsibilities. Oftentimes, their line of work overlaps with doctors and other professionals in the healthcare field. The decision to achieve higher studies and pursue advanced training as a nurse practitioner is a popular option for many registered nurses. What Is a Nurse Practitioner Personal Statement? It is basically a story of how you ended up choosing to be a nurse practitioner. It is important to show that your knowledge of the profession, although may not be so deep, is sufficient enough to sustain the idea that you know what you’re applying for. It is a boost to your resume and an essential part of your application paraphernalia which serves to make your name stand out among the other hopefuls. How to Start Writing It? You may start by relaying an important life event which may have inspired you to pursue this career. It should sound personal enough but avoid the storyteller tone. Useless adjectives when describing places or recounting your experiences. We don’t want to make your statement to sound like a chapter from a novel. Although it is important to engage your reader and make them read your application from start to finish, it is more probable that you will lose them in the middle of your story. Simplicity is still the key. Some personal statements begin with introducing yourself and highlighting your academic strengths and skills. Keep in mind that the admitting committee will browse through hundreds of applications. It is important to put essential information about yourself in the first two paragraphs. This will give your reader the impression that your personal statement is worth their time reading. Some statements require you to answer a simple question like why did you choose to be a nurse practitioner or why did you choose their institution to apply to. The admitting bodies hate clichés. Don’t try to answer using common phrases such as “I want to be a nurse practitioner to expand my nursing skills.” Try to be specific. You can mention an experience you may have had or a recent life event which may have inspired you to take this path. While it is quite tempting to try to use uncommon and deep words to highlight the broadness of your vocabulary, chances are your statement may sound like a literary piece rather than a professional one. Stick to simple phrases. You are writing nursing personal statement, not a novel. Avoid the excessive use of adjectives and metaphors. They might sound confusing and it might seem like you’re trying too hard. Keep the professional tone and try to sound natural. What to Include in Nurse Practitioner Personal Statement Examples? Although you may not want to make your personal statement seem like a summary of your resume, essential to it is a brief introduction of yourself, together with your title and your academic achievements and recognition. Point out relevant skills and body of knowledge which you think may be of use to be a nurse practitioner. Individualize your nurse practitioner goal statement examples by adding certain experiences you might have had which inspired you to pursue this profession. These do not only serve to highlight your interest in the position but also serves to give your evaluator a quick view of the type of person you are and your views and opinions. It also helps to reiterate that you have the qualifications for the job by highlighting your capabilities and your positive traits within your life story. Tailor fit your personal statement. You may browse through nursing personal statement examples to give you an idea of how others have written their own. Do not, however, make the mistake of general personal statements and passing the same composition to the different institutions you’re applying for. Your personal statement, as well as your personal statement for nurse practitioner program, are your key to the position you are hoping for. The way you write it and what you include in it briefly defines you and the kind of a nurse practitioner you can be. Keep it precise and simple. Make nurse practitioner essay examples personal enough while maintaining the professional tone. Stand out. Grab that slot. Nurse practitioner personal statement is arranged online at any time with the help of the seasoned professionals within our team. Our professionals are more experienced in preparing a tight personal statement for practicing nurses. Definitely, there is a great difference between student nurses and practicing nurses to a significant extent. It is essential to create a special format personal statement for practicing nurses. This will be fulfilled very wisely from our team that is more experienced in the creation of such successful nursing schools personal statements for years. Your personal statement is a testimony of yourself as a trained professional. When you apply for this program or any course for that matter, you should give it your best shot and make sure you have done your best with writing your nursing personal statement. Several writers and experts are willing to extend a helping hand with writing your intellectual autobiography. Ask for assistance. The help you need is just around the corner. Personal statement nurse practitioner should be a different style and quality from the student nurse personal statements. We are offering suitable services for writing these statements. Our statements will keep your profile at success standards always. There is a great value to acquaint well through the created statement with us for your profile. This way your academic profile created for admission will acquire good attention from the selection committee through the statement. Statement created in a well-defined manner with us for all the practicing nurses and our services will always match well to your needs too. Quality content with impeccable language will be presented in the statement through us. We will list all the past experiences and academic successes in a good manner and in chronological order within the statement. We will project, how well the practicing nurse profile will be more apt to seek this admission. There will be a detailed explanation about the suitability of the candidature to take up the studies within the created personal statement with us. Personal statement will be created basing up on the stipulated terms and conditions with us along with the appropriate format too. Nurse practitioner personal statement is arranged quickly through our service for all. Our team of writers acquired good successful tenure in this field and with more reliability for completing the clients’’ needs. You can always rely up on our services for your quality personal statement for nurse practitioners and our services are always kept at reasonable price too. Just reach our team of professionals online at any time to complete your nursing personal statement quickly. We are just a click distance to you to receive our services and to obtain right admission. If you are to include recollections of past experiences, make sure that these are related to the practice of being a nurse practitioner. While a climb to the top of a mountain and meditating there may have helped you arrive at your decision, it may not sound appealing, not even remotely interesting to the committee. What you may want to mention is an encounter with a patient or a certain experience you’ve had during a medical mission. Contact our professional now and grab your nurse practitioner personal statement right now!